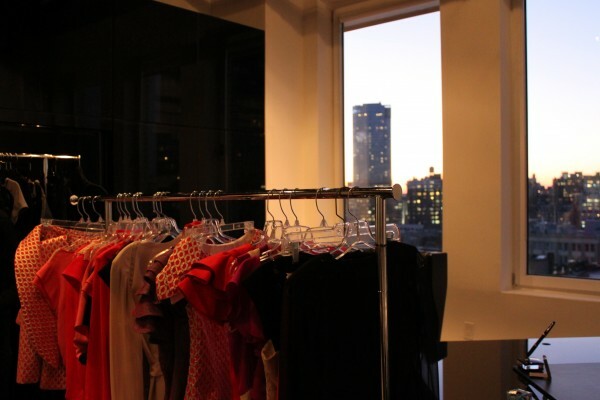 Today, I had the fitting for the Polyvore Live Fashion Show presented by Covergirl which will take place next Monday. It was so great to seeing the Polyvore girls again, meeting the designers and some of the other bloggers who will walk the runway. I will be wearing one gorgeous red chiffon dress by Dana-Maxx Pomerantz. Here you see her talking to me. Her creations are colourful, feminine and with a light, beautiful vintage touch. I like her style a lot. My own ankle boots with studded heels by Stella McCartney (They are also available without the bow. If you are interested, please click here). The second outfit that I will presenting on the runway is designed by Lauren Bagliore. She has a very edgy style and her clothes can be easily layered. This black “Theophila” dress can be worn in many different ways. Pretty cool! Don’t forget to watch the livestream of the show on Monday! Anda, the stylist for the show.